Breed Group: Non-Sporting Weight: 6-8kgs Height: 30-32 cms Color(s): All colors and mixtures, white allowed on feet Coat: The Tibetan Spaniel is a double coat breed. The outer coat is of medium length and is silky, soft, and flat. Distinct feature: they have long and silky fur with miniature size. Eyes and nose are distinctively black. They have punch face. 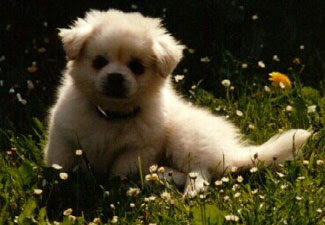 Temperament: Tibetan Spaniel is active, small, and alert. The Tibetan Spaniel is a highly intelligent breed and is deeply devoted to their family and friends. They thrive on human companionship, are extremely sensitive, and will respond to their owner's moods, emotions, and feelings. They do best with older, considerate, well-behaved children. This breed is generally aloof with strangers but is never aggressive. They get along very well with other pets. Activity: Tibetan Spaniels need daily walks and runs. They love to play outdoors and are at their best when properly exercised. It is important that they are always securely leashed and fenced.